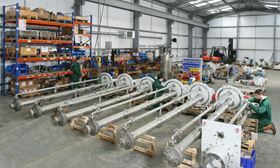 Amarinth engineers undertaking API 610 VS4 pump assembly. Amarinth has secured a US$600 000 order through its agent Nama to provide API 610 VS4 pumps for the offshore Umm Shaif Super Complex operated by ADNOC (Abu Dhabi National Oil Company) in the United Arab Emirates. This latest order is for eight vertical API 610 VS4 drain sump pumps manufactured in either stainless steel or super duplex depending on duty. The pumps will be deployed at the ADNOC offshore Umm Shaif Super Complex (USSC) in the Arabian Gulf. The USSC project involves the expansion of the existing oil network and increasing gas supply. Amarinth has worked with Nama for many years and successfully delivered against a number of high-profile projects. ADNOC recently introduced an In-Country Value (ICV) program for its suppliers with a focus on local supplier selection and development. Amarinth says that its close partnership with Nama delivers a high ICV, meeting ADNOC’s aims and objectives. Amarinth has developed a comprehensive, modular approach. Amarinth secures orders worth US$750 000 to supply API 610 OH2 pumps for Mozambique’s Coral South Development Project. The order, for six API 610 OH2 super duplex stainless steel pumps, is the first that Schlumberger has placed with Amarinth.